If you've read Barbara Kingsolver's popular book "The Poisonwood Bible" or other novels about Americans in Africa, you've likely developed a view of Africa as a dangerous, difficult and uncomfortable place. That is not at all the picture that you'll get when you read "To Africa With Spatula" by Jane B. Lotter of Davis. Her book is nothing short of joyful. And it's not fictional. Subtitled "A Peace Corps Mom in Malawi: 1965-1967" this self-published book ($15.95) is a collection of letters that Lotter sent home to her best friend and neighbor Pat Allen. "In 1964 we joined the Peace Crops and in January left for 2 ½ years in Malawi," said Lotter. "These are my letters home." Lotter and her husband, Will, took their four boys - Don, Mike, Scott and Rick - to Africa, making the Peace Corps a family adventure. "If you go anywhere with four little boys you have adventures before you get out the door, but I wrote everything down because it was so very different," Jane Lotter said, explaining how her book came about. The family returned to Davis and their home on Sunset Court in 1967 and that fall, on Jane's birthday, Allen presented her with copies of all her letters preserved in a binder. "It was the most wonderful gift I had ever received," said Lotter. "Through the years, people would read those letters and everyone would tell me that I should write a book but I had no idea how to go about it." Finally, in 1992-93 another Peace Corps friend typed all the letters into a computer for Lotter. "That was another wonderful gift," she said. "And then I had to learn to use a computer." She did, and spent another several years editing and fixing up the 100 letters. "I tried two publishers and it didn't work so I decided to self-publish and leave all the quirks of my style intact," she said. Pat Allen came to the rescue once again and the two women worked together to bring the book to life. "I feel so privileged to have had this experience (in Malawi) that I wanted to share it with the world," said Lotter. "It was the best thing we ever did." "I thought the letters were amazing, funny and fun," said Allen. "It was obvious, too, that they loved the Malawian people. I just thought those letters should be saved. And, besides, we're best friends." The Lotters came to Davis in 1952 when Will began teaching at UC Davis. They bought a house on Sunset Court at the same time Tom and Pat Allen, another university family, bought theirs. The Allens and the Lotters raised their children side-by-side. Will had been working at UCD for 10 years and Jane had been a busy housewife when they decided to join the Peace Corps: It was a family decision. They weren't Peace Corps volunteers living on the land but paid staff in Malawi's commercial center of Blantyre (named after missionary Dr. David Livingstone's birthplace in Scotland). Will was the deputy director of the Peace Corps in Malawi. Once in Africa, Jane Lotter spent much time opening her home to drop-in guests and preparing meals (including a pancake breakfast open house every weekend) for what must have been, over a two-year period, several hundred Peace Corps volunteers coming and going. They lived well in a house with electricity, water and plenty of household help. The boys were initially disappointed, they'd wanted to live in a hut in the jungle. The family also had a small zoo of dogs, cats, a monkey, chameleons, goats, and assorted African animals, several of which were sufficiently unusual that they were hard to identify. The boys attended a British prep school. And Jane and several other Peace Corps wives regularly helped out at a nearby Catholic mission that included a nursery for orphaned or sick infants. At Lotter's first visit, the 20 or so babies just sat on blankets and didn't move around. But as time went on and the women were able to hold and cuddle the babies regularly, they began responding by crawling and becoming more active. "It was amazing what a pair of loving arms could do," said Lotter. While Will was required to spend a good deal of time on the road, Jane dealt with the boys, their accidents and illnesses, and a series of unreliable vehicles she soon learned to drive even over narrow bridges (no guard rails!) above deep ravines. The family had adventures exploring the country and camping, too, and saw much of the wildlife Africa had to offer. Their friends included Catholic nuns, Peace Corps volunteers, British schoolmasters and Africans (the self-proclaimed Malawian president for life lived next door). Many of the Africans had given themselves English names: one of the boys had a friend named Corn Flake. 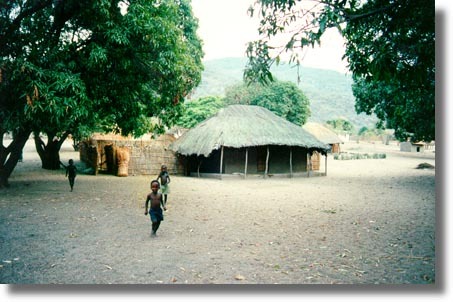 The Lotters have returned to Malawi three times including the entire family once, in 1989. What they have seen in recent years has been heart-breaking. "The country has been just decimated by AIDS," said Jane. The Lotters have not turned their backs on their adopted country. They support the Malawi Children's Village, a community based orphan care project that places AIDS orphans in the homes of villagers. Contact kdenny0000@aol.com to learn more. The Peace Corps experience forever changed the Lotters and made them what they are today. "We have hurled ourselves into human rights work, both at home and in Central America (it's closer to travel than Africa), spending two to three months every year in Guatemala," she said. That's why you'll see Jane and Will at the Farmers' Market selling on behalf of Guatemalan artisans. "If you can make a difference in the life of just one person, you have done a job," she adds. "This is such a hopeful thought that it has become like a mantra for me." My name is Tabassum and I am from Malawi, I was born and raised in Malawi, I have been in Sacramento,California for 16yrs and I have not yet met anyone from Malawi. My e-mail address is tabassum4@yahoo.com. I would like to know more about the Peace Corp and maybe meet with Jane and Will Lotter. Just to see what information you have from Malawi.